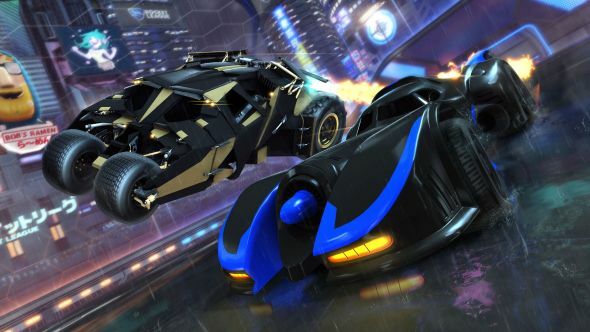 The Batmobile is coming to Rocket League. Psyonix have announced a DC Super Heroes DLC pack for their rocket-powered sports game. Scoring more own goals than wonder goals? Check out our Rocket League tips and tricks. The pack contains two new vehicles for Batman fans old and new, as the DC universe’s most famous car makes its way to the game not once, but twice. Fans of Christopher Nolan’s Dark Knight trilogy will recognise the Tumbler for The Dark Knight Rises. Fans of Micheal Keaton’s 1989 film are also catered to, with the pack also featuring the Batmobile from that film. That’s far from all the DC DLC in the pack – several other Justice League members are also represented in a collection of themed items. Aquaman, Cyborg, Green Arrow, Green Lantern, Superman, Flash, and Wonder Woman all get a selection of decals, banners, and wheels. The Flash also gets his very own boost, which is only fitting for the fastest man alive. It’s not all that surprising that such an expansive pack is coming to Rocket League – Warner Bros (who publish the DC Universe films) purchased the game’s retail rights from Psyonix in October 2017. The DLC pack will be available for download from March 5, and will cost $3.99. You can watch a trailer showing off the Tumbler and Batmobile, as well as a collection of decals, above.